Bacon Sriracha Avocado Deviled Eggs - Home. Made. Interest. These spicy Bacon Sriracha Avocado Deviled Eggs are a tasty twist on the classic deviled egg recipe. These smoky, spicy deviled eggs will be an exciting addition to your Easter dinner or your next potluck dinner! It’s deviled egg season! Not that we really need a season for deviled eggs because they are low carb I eat them year round. Deviled eggs are so easy to make and there are so many flavor combinations to experiment with. These Bacon Sriracha Avocado Deviled eggs are my current favorite. A little smoky, salty, flavor from the bacon, a little heat from the Sriracha, and some added creaminess from a perfectly ripe avocado. Bacon Sriracha Avocado Deviled eggs have it all in one amazing bite. The flavor combo is out of this world! Spicy sriracha, creamy avocado, and the little bit of salty crunch from the bacon…yum!! 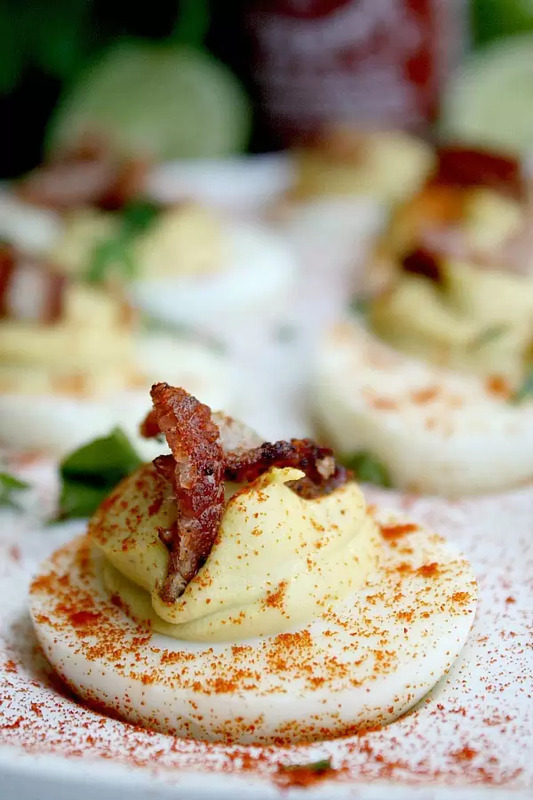 I took these Bacon Sriracha Avocado Deviled Eggs to a party with me, you know, to use my friends as guinea pigs for my deviled egg flavor experiment, and they were a hit! They were all gone by the end of the night and everyone gave them two thumbs up. They are definitely being added to my Easter dinner menu! 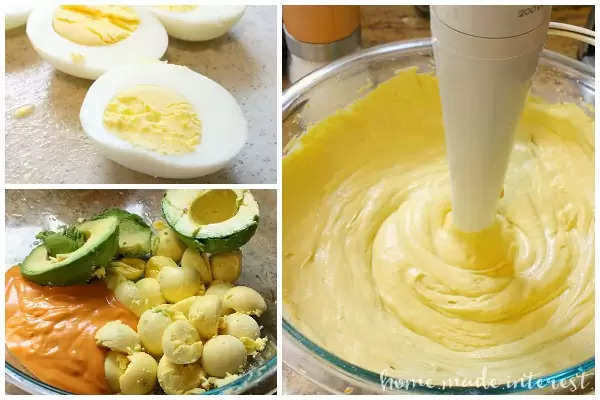 You can make these deviled eggs ahead of time but because they have avocado in them you should wait to pipe them into the eggs until you’re almost ready to serve. This is because avocado starts to turn slightly brown as it is exposed to the air. If you make the filling the day before press a piece of plastic wrap down on top of the mixture before sealing it. This will keep the avocado in the mixture nice and fresh. Use an immersion blender (stick blender) or a food processor to blend all of the ingredients together. This will give you a smooth creamy filling. Hard boiled eggs should be used within one week of being cooked. Recipes like deviled eggs should be kept tightly wrapped in the refrigerator and eaten within 2-3 days. Want more deviled egg recipes? 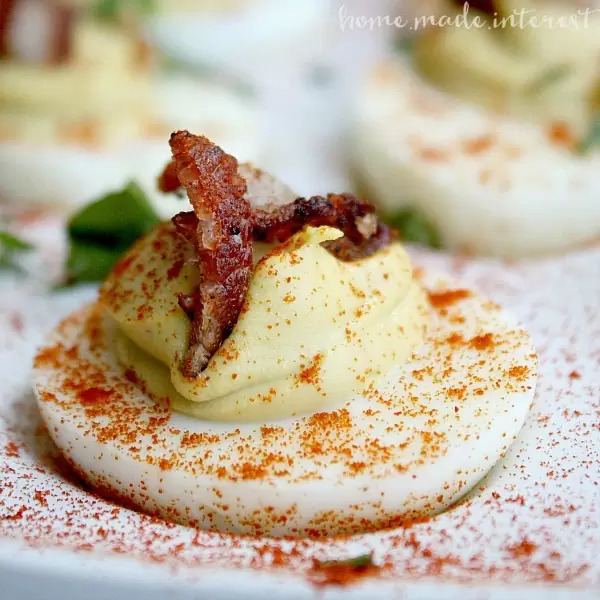 These spicy deviled eggs are a tasty twist on a classic with the zing of Sriracha, the velvety smoothness of avocado, and the saltiness of bacon. Sriracha Bacon and Avocado deviled eggs are low carb and gluten free and make a great party appetizer and Easter dinner and Easter brunch recipe! Hard boil eggs, then peel and slice in half removing the yolks and placing them in a bowl. To the yolks add avocado, sriracha, mayo, and lime juice. Use a stick blender to mix all of the ingredients together until they are smooth. Place yolk mixture in a piping bag and pipe into the egg white halves. I love deviled eggs no matter what the flavor combinations are together. I am a spicy food blogger so I’m definitely pinning this to save for later. I really like buffalo chicken stuffed eggs too. mmmmm good. So glad you shared at Sundays at Home, these look SO good!! This Looks so fantastic that it had my mouth watering. I think you could just skip the avocado and add a little extra mayo if you think it needs it. Has anyone made these ahead of time? With the avocado I’m afraid it’ll turn brown. The lime juice might help though. I could also separate the filling from the eggs (filling before serving) and cover with plastic wrap-an old guac trick. Any thoughts? Hi Jamie, we made it in the morning for a party in the evening and didn’t notice an issue. I was going to suggest that you could make the filling ahead of time and then cover it with plastic wrap then pipe into the eggs just before the party so I think that is a great idea. I made these ahead of time for a party. They looked fine when I made them, though more orange than the picture). When I took them out several hours later, they had gotten runny. Thoughts on what went wrong? Followed the recipe exactly. I haven’t a clue on why it was runny. I have made this recipe many times and never had this problem. I wonder if the size of the egg (yolk) could play a part in it?